1 - 11 $811.91 ea. Goodyear Tundra Tires from SkyGeek were originally created for installation on the Goodyear Blimp, so you know these tires are ready for anything. 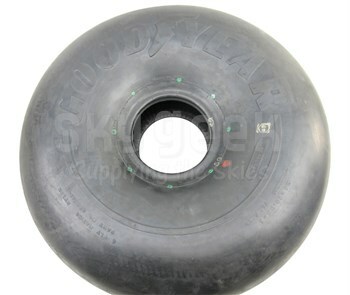 You may not fly a blimp, but it turns out that these tubeless tires work amazingly well on small aircraft. They work so well that they have been rebranded as the Goodyear Tundra Tire. Affordable, reliable and versatile enough for use on a wide range of small aircrafts, these tires are able to tackle a wide range of conditions without failure. Land on an airstrip or in a field with impressive results and smooth handling. While we�re confident in the capabilities of these tires, you may have to obtain an FAA Field Approval for the legal installation of these tires on your plane, but we assure you that it's worth it.